Need a good, inexpensive 9mm training round? Remington’s Express pistol and revolver line delivers performance that meets your bottom line. These 115-grain 9mm target rounds feature a metal case projectile, loaded into boxer-primed, noncorrosive, reloadable brass cases and are capable of a muzzle velocity of 1145 FPS. 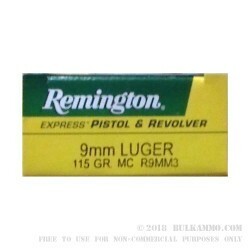 Remington’s metal case design is essentially the same thing as a full metal jacket and makes for a great paper punching and plinking round for your favorite handgun. This American-made ammunition comes from an American legend and contains 50 rounds of 9mm 115-grain metal cased ammunition per a box. For generations, Remington has been a household name for firearms enthusiasts. Since 1813, Remington has been a producer of reliable firearms and ammunition. Remington continues to be an American institution, with manufacturing plants across the United States.